The day could not have dawned with less promise. After the achingly beautiful weather of the past few days, the grey skies that greeted me at breakfast were doubly disappointing. From the patio of our hotel on the southern shore of Anegada, I could see storm clouds massing over the distant water. 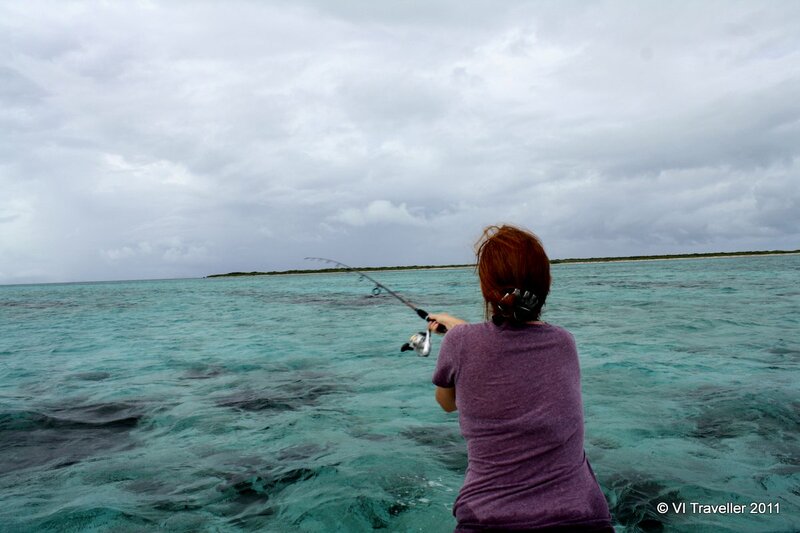 Fishing on the Horseshoe Reef, Anegada. I wondered if Kevin Faulkner would cancel our scheduled fishing outing but he arrived, right on time, puttering up to the dock in on a small boat designed to coast safely through even the shallowest of waters. By his clothing I know that our outing is on: he is dressed in waders, a fishing vest and sunhat. Kevin is a native Anegadian and like his ancestors, fishing is in his genes. Slight in build and handsome in face Kevin left the island some years ago to attend college and pursue a career. Now back home, Kevin brings a professional sensibility to his sportfishing outfit, which also offers eco-tours and snorkelling outings. Anglers come to Anegada, the northernmost of the Virgin Islands, to hunt its flats for bonefish, a most elusive species of fish that’s too bony to bother eating. Perhaps the most famous sojourner was U.S. President Jimmy Carter, who wrote about the experience in a chapter of his memoir An Outdoor Journal, concluding that the tiny torpedoes known as ‘grey ghosts’ are indeed one of the ultimate challenges of fly-fishing. Kevin explains that the attraction is the challenge: extremely difficult to find, easy to spook, and mighty fighters on the line, landing a bonefish is the mark of a skilled fisher. “You have to do everything right to catch a bonefish,” he says. The odds of me doing everything right on this most inauspicious day seemed downright nil. The skies are still grey and the rain starts to fall almost as soon as we get out on the water. We are travelling east along Anegada’s southern shore and directly into a rain cloud. Raindrops that would merely have been wet on land become pin-pricks of pain against my exposed skin and soon I am soaked and cold. But then the cloud passes, the rain stops, and suddenly the grey skies don’t bother me so much: grey and dry is better than grey and wet. Kevin takes us first to the inner edge of the reef where he teaches me the basics of casting. After a few tries I come to enjoy the fluidity of the movement: raising my arm back and then throwing the line out into the distance. Kevin explains that using the rhythm of my reel I can mimic the movements of various sea creatures and attract different types of fish. I was attempting to be a shrimp when I felt a perplexing tug on the end of the line. Even before my mind registered what was happening Kevin jumped into position: I had a bite! It was only a small jack which we returned to the sea, but I felt the glow of my first catch. 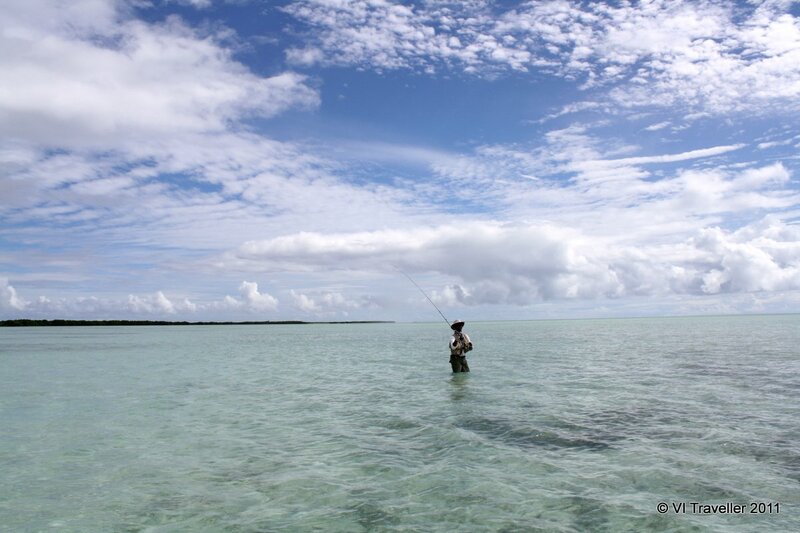 My guide, Kevin Faulkner, fishing on the Flats in Anegada. Our next stop are the flats, where the bonefish live. Kevin punts along the edge of the mangroves in water so clear and shallow that I can see a host of sea life just below us: juvenile snapper, barracuda, jacks, shellfish, tarpon and sea cucumbers. The flats before us are a patchwork of blues: searing turquoise where the bottom is sandy and a deep green-blue where seagrass beds lie. Kevin looks for evidence of bonefish. The long and strong silvery fish travel in groups of 1,000 and more so you’d think they’d be easy enough to find. But each time Kevin identifies a tell-tale sign and points it out, my eyes are blind to the nuance. I, who take pride in my observation skills on land, feel utterly befuddled by the unfamiliar marine environment that surrounds us. We pile out of the boat and stand in the 3-foot water. We are to walk and cast in the direction of the bonefish. Kevin proceeds soundlessly through the shallows his feet knowing every underwater hillock; without breaking stride he flicks his fly rod in a wide arc overhead. Meanwhile I splash, hopelessly, forward. The bottom is sandy but uneven and even at my most careful I find it impossible to mimic Kevin’s silent march. Once we are stationary things are blessedly quiet however, and we cast without speaking. Concentration casts a spell and I throw my line again and again, hoping that this will be the moment when I feel the pull of a bonefish on the other end. No one nibbles though, and eventually, stomachs reminding us that it is past lunch, we wade back to the boat. I think that Kevin expects me to be disappointed. After all, if you go bonefishing on Anegada you expect to catch a bonefish, don’t you? He shows me photographs of some of his clients, including a man he took out two days earlier, who smiles broadly next to a glistening silver fish. Kevin practices catch, revive and release—that is, he doesn’t just throw the fish back but he tries to maximize its chances of survival by doing so right away. So the moment after a catch is exciting and fast-paced: the fisher high on the thrill of his catch, Kevin quickly snaps a photograph and then carefully unhooks the catch and returns it to the sea, where it can haunt again. It’s exciting to hear Kevin tell it but I conclude that if a bonefish allowed me to catch it on my first-ever sporfishing outing, it wasn’t living up to its reputation. As Kevin turns the engine and we skid out over the water I look over my shoulder at the quiet cove of blue water, green mangroves and nature’s most elusive fish. As the scene disappears into the distance I know that I’ve been hooked: I will be back. This article first appeared in the September/October 2012 issue of the BVI Welcome Magazine.